Do you worry about elderly parents living in France without family support, or in isolated areas? The post office now offers a paid service to help out. For a monthly payment, the postman/woman will not just deliver the mail but will pop in for 5 – 10 minutes as many days as arranged by you. The person will also receive a wrist band alarm with a button to press in case of emergency. They will have a chat, go through a list of specific questions (Are you well? Do you need anything? etc) and inform children or relatives if there are any problems. After each visit, you will receive a summary by text or email. Postal workers are given training to manage different situations. 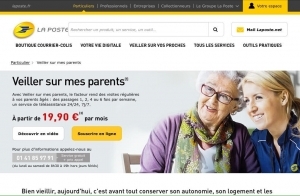 Sign up online for the ‘Veiller sur mes Parents’ initiative at www.laposte.fr. If you live out of France, call 00 33 1 41 85 97 91. Pimp (meaning someone who lives off the earnings of a prostitute) comes from the Medieval French pimper “to dress elegantly”. Ironic because the stereotypical pimp is hardly known for his attention to style!